A challenge has been issued on matters of faith and Becky Garrison meets it head on in this witty yet poignant answer to the Anti-God gurus Richard Dawkins, Sam Harris, and Daniel Dennett. Becky Garrison, religious satirist and senior contributing editor for The Wittenberg Door, is taking a stand. Where most Christians assume the character of the Cowardly Lion chanting, "I do believe, I do believe, I do believe," Garrison refuses to simply thrust tracts at these self-proclaimed infidels. Instead, Garrison steels her pen and takes on the ungodly program of the New Atheists, skewering each argument with her sharp satiric wit. Garrison turns aside the atheists' assault without ignoring its real criticisms, namely, the church's inadequate response to war, evolution, medical ethics, social justice, and other important issues in the post-9/11 world. - Publisher "Employing a whetted wit and unique spiritual perspective, Becky Garrison wields her irreverent and insightful satire to turn aside the assaults of pop atheists such as Richard Dawkins, Sam Harris, and Daniel Dennett." --BOOK JACKET. - Publisher Anti-God gurus Richard Dawkins, Sam Harris, and Daniel Dennett have successfully seized the mass media spotlight by ridiculing people of faith and impugning any positive purpose for religion itself. Theirs is an armored-assault on belief, a crusade, that cannot go unchallenged. Becky Garrison, religious satirist and senior contributing editor for The Wittenberg Door, is taking a stand. Where most Christians assume the character of the Cowardly Lion chanting, "I do believe, I do believe, I do believe," Garrison refuses to impotently thrust tracts at these self-proclaimed infidels. Instead, Garrison steels her pen and takes to the lists against the ungodly program of the New Atheists, skewering each argument upon the poignard of her satiric wit. Her goal: to turn aside the atheists' assault without ignoring its real criticisms, namely, the church's inadequate response to war, evolution, medical ethics, social justice, and other important issues in the post-9/11 world. 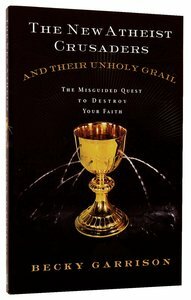 About "New Atheist Crusaders and Their Unholy Grail"
"Employing a whetted wit and unique spiritual perspective, Becky Garrison wields her irreverent and insightful satire to turn aside the assaults of pop atheists such as Richard Dawkins, Sam Harris, and Daniel Dennett." --BOOK JACKET. Anti-God gurus Richard Dawkins, Sam Harris, and Daniel Dennett have successfully seized the mass media spotlight by ridiculing people of faith and impugning any positive purpose for religion itself. Theirs is an armored-assault on belief, a crusade, that cannot go unchallenged. Becky Garrison, religious satirist and senior contributing editor for The Wittenberg Door, is taking a stand. Where most Christians assume the character of the Cowardly Lion chanting, "I do believe, I do believe, I do believe," Garrison refuses to impotently thrust tracts at these self-proclaimed infidels. Instead, Garrison steels her pen and takes to the lists against the ungodly program of the New Atheists, skewering each argument upon the poignard of her satiric wit. Her goal: to turn aside the atheists' assault without ignoring its real criticisms, namely, the church's inadequate response to war, evolution, medical ethics, social justice, and other important issues in the post-9/11 world. Becky Garrison serves as Senior Contributing Editor for The Wittenburg Door, the oldest, largest, and only religious satire magazine in the United States. Her additional writing credits include work for The New York Times, The Tonight Show, Relevantmagazine.com, and Christian Retailing. Garrison also contributes to The Ooze and blogs on God's Politics. She has a dual Master of Divinity/Social Work degree from Yale University and Columbia University, and an undergraduate degree in theater arts from Wake Forest University and has authored The New Atheist Crusaders and Their Unholy Grail: The Misguided Quest to Destroy Your Faith(Thomas Nelson), Rising from the Ashes: Rethinking Church (Seabury Press) and Red and Blue God, Black and Blue Church: Eyewitness Accounts of How American Churches are Hijacking Jesus, Bagging the Beatitudes, and Worshipping the Almighty Dollar (Jossey-Bass).